Editor’s Note: The 2016 annual meeting of the Society for Neuroscience took place November 12-16, 2016, in San Diego, US. Part 1, below, of our coverage of the meeting is a summary of a featured lecture delivered by David Julius, University of California, San Francisco. The lecture discussed the use of natural compounds to understand the structure and function of the TRPV1 ion channel. (See Part 2 here and Part 3 here). Spicy plants and venomous beasts are the sources of natural products that have been used for decades to study neurophysiology. 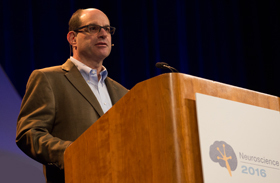 At the 2016 annual meeting of the Society for Neuroscience, David Julius, a physiologist at University of California, San Francisco, US, delivered the Albert and Ellen Grass Lecture, “Natural Products as Probes of the Pain Pathway: From Physiology to Atomic Structure.” The talk presented the fruits of over 20 years of research by Julius and others using compounds found in nature to understand pain. Julius was the first to genetically clone the transient receptor potential vanilloid type 1 (TRPV1) ion channel, which senses heat and capsaicin—and TRPV1 was the star of the show. Julius began the lecture, given just days after the US presidential election, with a call to the audience to recognize and appreciate “the rich global community we make up as scientists.” He then recognized his “heroes,” pioneering physiologists who also used plant products to study pain. They include Solomon Snyder, whose lab at Johns Hopkins University first identified endogenous opioid receptors; Sir John Vane, who described the anti-inflammatory effects of aspirin; and Raphael Mechoulam, who discovered the endocannabinoid system. “It’s really quite amazing that many of the drugs we rely on today emerged from folk medicine,” Julius said. Rather than look for pain-relieving substances, Julius said he wanted to “flip the coin and find compounds that would activate pain.” From a long list of compounds, a few emerged that could selectively activate pain-sensing nerve fibers, including capsaicin, menthol—which is cooling but can be painful—and isothiocyanates, volatile substances found in onions and other plants. In addition to activating sensory neurons, these compounds also elicit the release of inflammatory mediators such as substance P, calcitonin gene-related peptide, and adenosine triphosphate. The TRP family of channels is diverse in function; the earliest known role for a TRP channel was in the vision pathway in the fly eye. The TRP channels important to somatosensation—namely TRPV1, TRPM8, and TRPA1—are activated by compounds found in nature, but also by intrinsic factors such as temperature and endogenous inflammatory substances. TRPV1 opens in response to capsaicin and temperatures above 45 degrees Celsius—the point at which people discern painful heat—whereas TRPM8 is activated by menthol and by temperatures below 26 degrees Celsius. The channels were subsequently found to respond to many molecules, including lipid-based cellular signaling molecules, but these molecules were all thought to act as allosteric modulators—that is, they made the channels more responsive to temperature, their endogenous activator. From that idea emerged the question, Do these channels truly act as inherent temperature sensors in the absence of any other signaling molecules? Work by Julius and others showed that when TRPV1 channels were reconstituted in artificial lipid bilayers—with none of the usual cellular signaling molecules present—they did indeed retain their ability to open in response to heat (see PRF related news). In work aimed at discovering the role of TRPV1 and TRPM8, researchers genetically modified mice so that they did not express the channels. Without TRPV1, mice showed “robust differences in radiant heat sensing, suggesting that it contributes significantly to noxious heat sensing,” Julius said. Mice lacking TRPM8, in contrast, could not distinguish between warm and cool floor plates, suggesting that this channel also plays a role in temperature discernment. A continuing question in the field has been whether different sensations such as hot and cold travel along so-called labeled lines to the brain. That is, do dedicated pathways exist for distinct sensations from the body to the brain? To get at that question, Allan Basbaum, also of UCSF, injected capsaicin into the dorsal horn of the spinal cord of neonatal mice, resulting in ablation of sensory neurons that contain TRPV1 (Cavanaugh et al., 2009). “Those mice had a profound defect in heat-detecting ability, but they had no problem with cold or pressure detection,” Julius said. That suggests that, indeed, heat and cold are transmitted along distinct “lines,” in keeping with the theory. But rather than simply functioning as the body’s heat detector, TRPV1 is now recognized as a polymodal signal integrator, Julius said. The channel can be modulated or opened by ingredients in the “inflammatory soup” found at sensory nerve endings after injury. Capsaicin, protons, and bioactive lipids all act at the same site to shift the channel’s activation threshold. “These are the molecular correlates of allodynia and hyperalgesia,” Julius said, referring to pain sensitization that occurs after injury. Antagonists to TRPV1 have undergone clinical trials, but did not progress because they raised subjects’ body temperature by about one degree and made them less able to sense potentially damaging heat (see Rowbotham et al., 2011). Future attempts to dampen pain by inhibiting TRPV1, Julius said, should be directed not at blocking the channel’s heat-sensing ability, but instead at stopping inflammatory mediators from exerting their sensitizing influence. Recently, Julius and colleagues at UCSF have focused on studying how the TRPV1 channel opens and moves, and how that might be exploited to diminish TRPV1 activity. The N- and C-termini of TRP channels are remarkably diverse, allowing ample opportunities to interact with other molecules, but researchers wanted to see the channel’s structure in three dimensions. Investigators suspected that TRPV1’s structure resembled that of voltage-gated potassium channels, which had been visualized using X-ray crystallography. But because TRPV1 moves so dynamically—and crystallography depends on the settling of proteins into a stable conformation—the channels resisted crystallization. 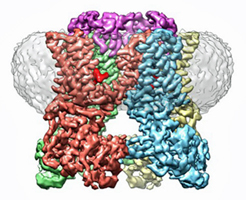 In 2013, Julius and UCSF colleagues published two papers solving the structure of TRPV1 using another technique called electron cryo-microscopy, or cryo-EM. Individual TRPV1 channels were suspended in lipid nanodiscs, allowing a glimpse of the channels with a resolution down to three angstroms (see PRF related news). Here’s to looking forward to the next 20 years of research on these remarkable thermosensing proteins.